We began on Sunday by watching this video that introduces us a little bit to the doctrine of the Trinity. It helps us to get orientated to what the topic is about, and what it all means. 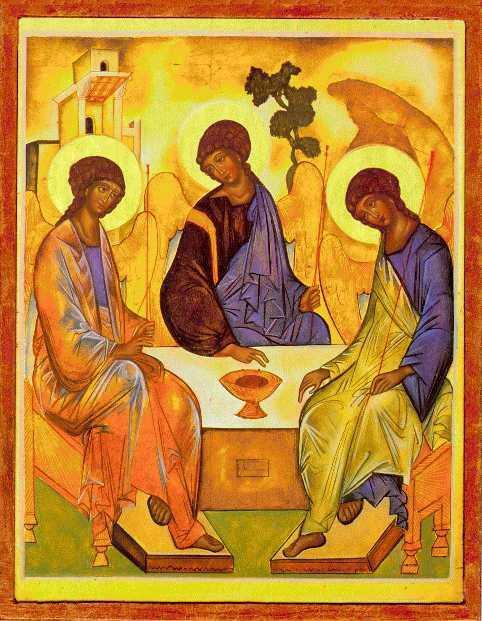 The Trinity in a nutshell (which is an oxymoron) is this: God is one being, in three persons. Or God is three-in-one. This is difficult to understand but has some really important practical implications. So to begin with we looked at how the doctrine of the Trinity developed out of the Scriptures. The scriptures clearly speak as God as one, but they also then speak about there being a plurality within God. If you look at the Baptism of Jesus you see the Father speaking, the Son rising out of the water, and the Holy Spirit as a Dove descending. So there is this oneness to God, but also a plurality. We then moved to discussing what is the oneness that holds the trinity together? And the clear answer is love. Love as the centre of God (see last week), is also the centre of the Trinity as the loving relations between the Father, Son, and Spirit bind the Trinity in oneness. That’s a beautiful picture of the Trinity being a divine dance of love, and invites us to participate as they open space not only for one another but also for us. This is a very practical assertion for this reason. If God is bound in love together in unity, self-sacrifice, and submission this gives us a model for how we are to live in our relationships. If the relationships between the Father, Son, and Spirit are characterized by mutual submission and love this then is not only an explication of God, but a invitation for us to follow God in mutual love and submission in our relationships. This means in our churches, communities, marriages, and neighborhoods we should be seeking to live with mutual love and giving. We should be inviting others into the dance of love that we follow the Trinity in. What stuck out to you from the sermon? What was challenging to you? How did God speak to you through it? What was new? Have you ever wrestled with understanding the Trinity before? What was helpful in thinking it through, what wasn’t? Had you ever heard of the idea of God being a dance of love at his centre? What did you think of it? Were you more like Krista or Andrew in his Flatland analogy? Excited or not? What helps you picture or think about the Trinity? Talk to your kids about the Trinity. Use it not as an exercise in telling them things, but realizing how beyond God really is than us. Listen to their questions, fumble, give it your best, and in the end be grateful that we can’t understand everything about God, but can trust him. Challenge for the Week: Be like the Trinity and be loving. Previous Why the Trinity and What’s the Trinity?